As a professor of anthropology and history, I was surprised to find rows upon rows of racist memorabilia during a recent trip to Cuba. These souvenirs, including sculptures, figurines and wall hangings, draw from a range of familiar images and ideas used across the globe for centuries to normalize the subjugation of Africans and Black people in contexts ranging from colonial Africa to the Jim Crow era in the United States. As our global village becomes closer, it continues to be important to consider our ethics as we travel abroad. 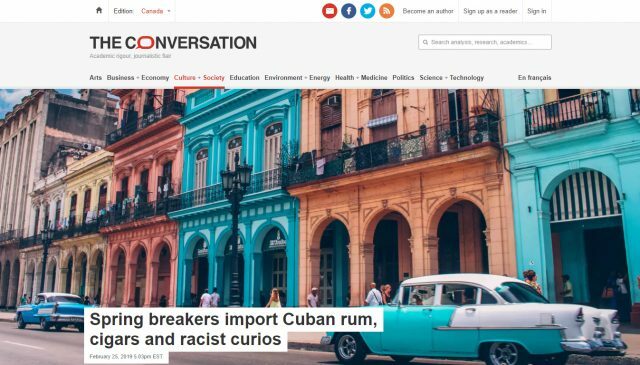 Read the full article – Spring Breakers Import Cuban Rum, Cigars and Racist Curios – over on The Conversation. As a curator, activist and scholar, Dr. Monica Eileen Patterson is interested in the investigation of difficult histories. Her work explores the intersections of memory, childhood, and violence in postcolonial Africa, and the ways in which they are represented and engaged in contemporary public spheres.